Janet Trafton Mills was sworn in as the 75th Governor of Maine on Wednesday, January 2, 2019. A fighter for Maine people and a fighter for a better future, Janet Mills ran for governor because she believed it was time for change -- a new direction for the state based on bold ideas and courageous, independent-minded leadership. As governor, she is fighting to see that every Maine person has affordable, high-quality health care, that Maine has a strong economy with good-paying jobs in every part of the state, that every Maine child has access to a world-class education, and that Maine is a place where families can put down roots and raise their kids. Janet was born and raised in Farmington, Maine, where she still proudly lives today. The granddaughter of Aroostook County potato farmers and the daughter of a long-time high school English teacher and the U.S. Attorney for Maine, Janet learned the value of hard-work at an early age, venturing out early every morning to deliver newspapers along her route and serving meals in the evening at the local diner. She graduated from Mt. Blue High School in Farmington, the University of Massachusetts at Boston, and the University of Maine School of Law. In 1985, she met and married the love of her life, her husband, Stan Kuklinski, a widower with five young daughters ages four to sixteen. Janet and Stan moved back to Farmington, and she became a full-time mom to five daughters who she helped raise while working full-time herself. She is now the proud grandmother to three grandsons and two granddaughters. After a devastating stroke, Stan passed away in 2014. In the last year of his life, Janet learned firsthand what thousands of Maine families go through every year—a complex and confusing health care system, rejection letters from insurance companies, and unaffordable prescription drugs even for those lucky enough to have coverage. This is one of the reasons why Janet is so determined to ensure that every Maine person and every Maine family has access to affordable, high-quality health care. 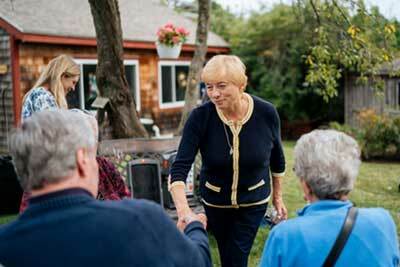 Prior to becoming governor, Janet served as the Attorney General of Maine – the first and only woman to hold the job. As Attorney General, Janet has made it her mission to stand up to those who have tried to exploit Maine people—from fighting dishonest mortgage lending companies to help keep Maine people in their homes, to fighting big Pharma for their role in creating the opioid crisis and then using that money to purchase overdose-reversal kits that have saved more than 500 lives, to fighting to protect health care coverage for young adults. Governor Mills is the first woman governor of Maine. In her historic victory, she earned more votes than any governor in state history and is first governor since 1966 to win a majority of the vote for her first term.